Al Ain: Four male lowland gorillas are anxiously awaiting female company in Al Ain Zoo, where plans are afoot to start a breeding programme just as soon as their new compound is complete. Dad Jambo and his three sons Mzungu, Wimbe and Mapasa, were imported in from Apenheul Primate Park in the Netherlands last month, and are currently living in a separate section of the Big Cat Oasis in Al Ain Zoo until their new facility — a 10,000 square metre jungle — is built. They are the first gorillas in Al Ain Zoo since the death of long-time resident Lady in 2016. She lived alone with only a rabbit for company because after the death of her mate Maxi 18 years previously — and due to her advancing years — it was feared she wouldn’t accept any newcomers. Maxi and Lady lived together in Al Ain Zoo since 1978, but never bore offspring before Maxi died of natural causes in 1998. In a couple of years we plan to build a new facility for them and introduce a female [in the zoo]. Now there is hope that for the first time in Al Ain, the pitter-patter of tiny feet will finally be heard in a new gorilla compound which is in the pipeline, just as soon as some new women are integrated. “In a couple of years we plan to build a new facility for them and introduce a female to bring breeding to the zoo,” Al Ain zookeeper Mayed Al Beloushi told Gulf News. “That’s an exciting prospect for the future and those offspring will be the first gorillas born in Al Ain Zoo. 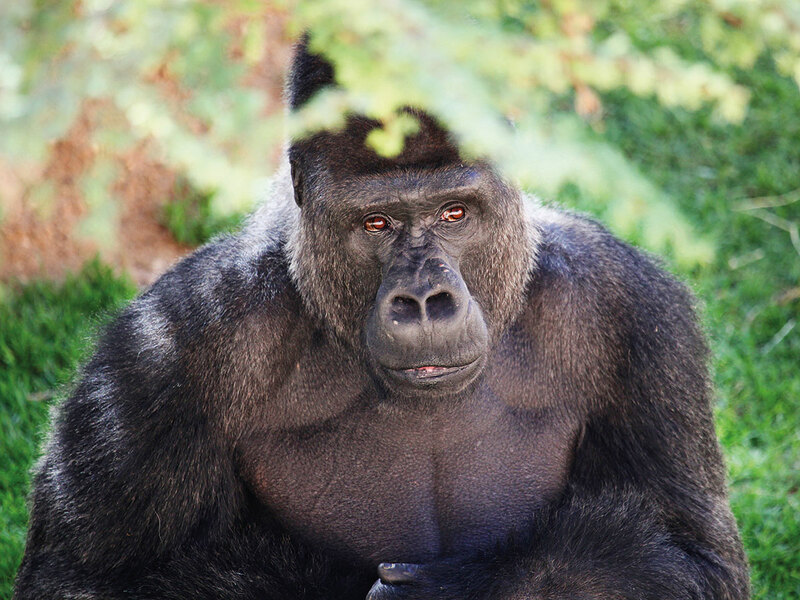 Lowland gorillas live in dense forest and lowland swamps in marshes as low as sea level in central Africa. Because of poaching their numbers have declined by 60 per cent in the last 20-25 years, according to the World Wildlife Foundation. Even if all threats are removed, scientists calculate that the population would take 75 years to recover. Gorillas are highly intelligent, especially when it comes to communication. They have been recorded making 25 different sounds and one famous captive-born gorilla named Koko even learnt sign language picking up 1,000 signs, while understanding 2,000 words of English. They live up to 35-40 years, weigh between 140kg and 170kg, have one baby every four to six years, in total giving birth three to four times, and have even been heard using baby talk to speak to their offspring.